The best laid plans! I had all intentions to keep this up to date but I have been doing a fair bit of work over the last fews months, both from modelling perspective and particularly from my job. Things are likely to remain this way on this front with the recent news we have our second child on the way which I am stoked about. Back to the modelling – most of my time over the last months has been completing the benchwork, of which detail will follow in another post. I have also soldered up the code 55 “frames” of all the turnouts to be used on Grenfell. I still have to add the remainder of the sleepers that aren’t PC board and will add pictures of the completed points once they are all done. I was unable to get hold of any brass rail chairs which was the most disappointing aspect of this process but may use the urethane ones on the outside of the rails at least to give the right appearance. More details of the track work will also follow. In the meantime I have slowly being “finishing off” a few projects, of which I will post pictures of in the next couple of weeks. To start with is paybus FP13, a few years ago another run of these were done and I grabbed one to avoid the ridiculous prices that ebay was commanding. 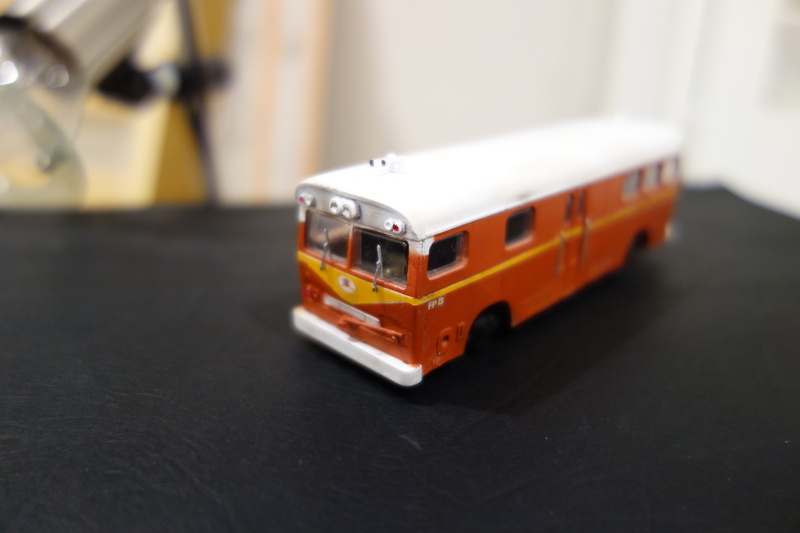 I have added wipers, N scale jewel for the markers and ho scale for headlights, horns, added the tow rod (is that what it was used for?) at the front as well as the bus now being DCC equiped. It is quite a smooth little runner. am not entirely happy with it so the jury is out of it will stay this way. Have also still to add the driver and some curtains! Anyway a quick pic as to how it looks now. Tank 1 – is based on Hay, those familiar with Gundagai will also recognise the style. I may use modellers license and use it at Grenfell as I like this style of tank that much, otherwise it will be used along the line. The tank itself is from Ian Lindsay Models, whose kits still rate against modern RTR when assembled with care. I added all the internal bracing using styrene strip, the cross braces on each panel were made using the strip then tapering each end by running a razor blade across the strips. All this was done before assembly ,slow process but am happy with the finished product. The remaining braces were added after, the tank was then painted and left while the stand was completed. Below is a not so great photo, but one to emphasize the bracing and “water”. The stand was constructed from Northestern timber, which was stained with a mix of raven oil and metho. I really like this stain and the grain it brings up in the wood. The stand was assembled per Greg Edwards data sheets, the “column” is a modified commercially available item, with other piping scratchbuilt from brass tubing. Strip styrene was added for all stand brackets with Grandtline bolt detail. Finally the tank was weathered with some dry brushing and washes. This was really effective on tank 2 but I may go over this tank again. I will add some remnants of the red they were painted to the stand before the tank is placed in position and still need to add the water level indicator. The cement footings were made from styrene tapered at the top. Tank 2 followed very much the same process and was only finished recently. It will be used at the loco depot at the other end of the line which will be explained in a later post . The tank is the Casula kit this time. 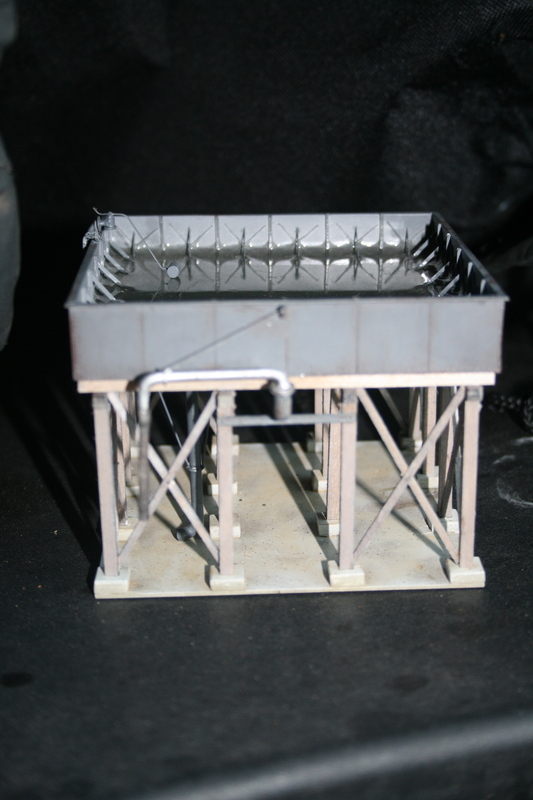 It has a different bracing arrangement then the above tank and is based around Merivale, the upright braces are styrene with slots cut in them and wire added. These were all painted before water is poured. The obvious difference is the stand which is the recently released Peter Boorman kit, all the piping used is from the same kit. It has some useful jigs for clumsy hands to! I really enjoyed this kit though getting all the footings “on the ground” is not easy, fortunately with ground cover and alike the small differences won’t be noticed. It was weathered as above and I am really pleased with the way it turned out, it looks a lot better in person than the photo below. The water level indicator still needs the indicator added and the float needs adjustment (temporarily bent up for the pouring of the water). In both of the tanks the water was the 2 part epoxy which is good but really needs care taken, tank 1 has a few small bubbles and may get another pour. Tank 2 turned out very well however as the epoxy cures it spreads the bracing so be warned and keep adjusting with each pour. 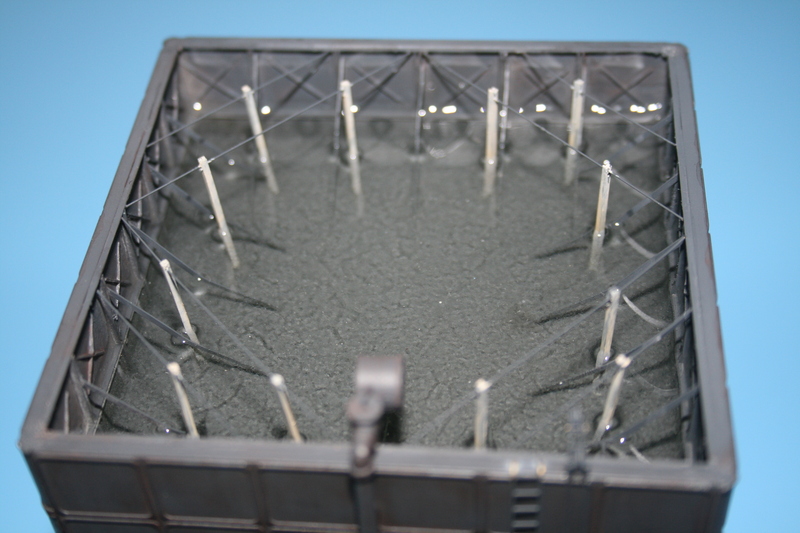 I have heard great things about “magic water” product and will track this down for the river/creeks on the layout. 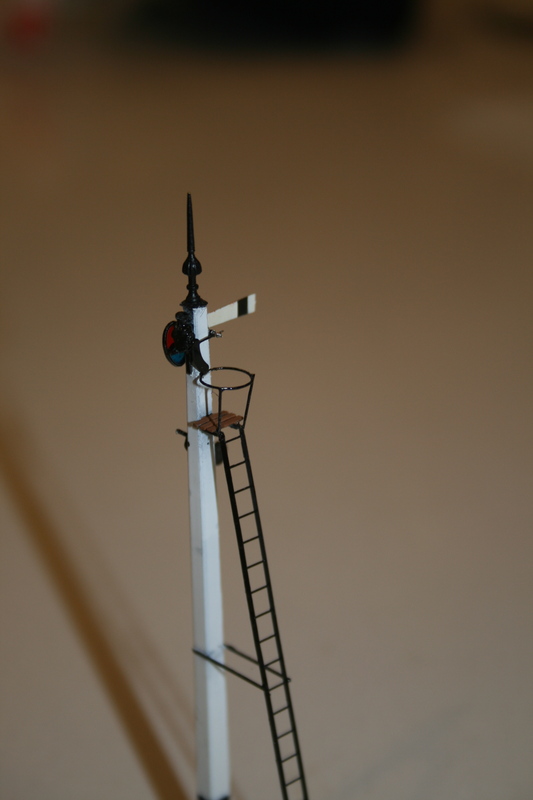 Unfortunately Grenfell was very limited in its need for signals as building them is an aspect of the hobby I really enjoy, so much so I have about 7 different signals built as well as a partially built gantry. With only an single A frame, one home signal and a landmark signal at Grenfell I have packed away all my signal parts to stop the temptation and concentrate on modelling. Both signals are soldered up from components that use to be sold as part of the IR Models range. The lamps have been drilled out and had .8mm LEDS inserted, the inside coated first to ensure no shorts. 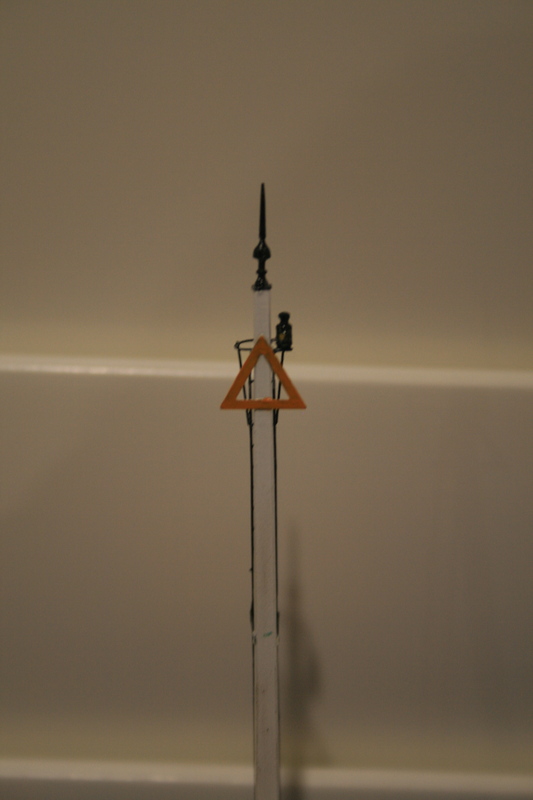 The home signal will be powered by a similar mechanism to the “bouncer”. Apologies for the poor picture of the landmark, the camera just will not focus in the light! The Purpose of this blog is to share my progress in constructing a layout that “captures” as best possible the principle elements of the terminus of Grenfell. It does not intend to satisfy rivet counters, but will cover the key aspects of the location and the track layout. Due to previous living arrangements my progress is a little in reverse. I have constructed most of the infrastructure at Grenfell ready to place on the layout, of which the best part is scratch built. Some elements I have changed, not shortcuts as they often required as much or more work, but changes based on availability of space or personal taste. Fortunately I have been able to start contruction of the layout bench work however this will be covered later with details of the trackplan. The next few posts will start illustrating the completed and semi completed projects.